With the continued growth of social media, everyone agrees that it’s a viable marketing channel for brands of all sizes. We’ve gone from asking why brands should use social media to how brands can use it better. Like all things, marketing success on social media will really come down to having a well-thought-out strategy. A social media marketing strategy summarizes everything you want to achieve through your efforts on the medium. It’s important to create a specific, concise strategy so that you can use it to guide your actions going forward. Having a strategy will allow you to analyze whether you’re succeeding or failing in your efforts. In this post, we’ll take you through the seven essential steps to creating a winning social media strategy. In order to reach where you want to go, you need to know exactly where you are. Chances are you already have a few social media accounts. If you do, that’s great, but you might want to take a quick look at your accounts and make sure that they’re optimized. Are your profile pictures/cover images/bio/website updated and accurate? What kind of posts are you making? Are they working? What networks are your target audience using? How do your profiles compare to those of your competitors? Once you know the answers to all these questions, you’ll have a pretty clear picture about what areas of your social presence you need to work on. This will also enable you to understand your position so you can set achievable, realistic targets for yourself. Now you’ll need to think about whether you need to trim something down. You may be inactive on some networks, or active on ones that your target audience isn’t using. Do you need to take these accounts down, or can you use them to achieve your goals with a little restructuring? With these answers in hand, you’ll have reached a solid platform on which you can build your social media presence. If you know who your target audience is, and you know what they want to see, you’ve already won half the battle. That’s why it’s important to get as specific as you can here. I recommend creating your ideal customer—a detailed persona sketch of the type of person you want to target. For example, if you define your target audience as school children, you might do okay. But if you get more specific, and say your target audience is school children between the ages of 13-17 who live in urban areas, have a particular household income range, and are interested in reading sci-fi comics, you’re much more likely to succeed. Give your ideal customer a name, an age, a backstory, and a nickname. This will help you see them as a real person with real needs, wants, and feelings. Connecting with your ideal customer will help you create content that’s perfectly suited to them. Try going into as much detail as possible—your ideal customer should have as much data as you could get from a person over a short conversation. Also keep in mind that you need to use real world data while creating this information—don’t randomize your ideal customer’s favorite network. There’s tons of research available online that will tell you the demographics of each social network. With this data, you’ll be able to figure out the right one for your business. Your competitors are probably using social media to market themselves. While they may have a head start, you can analyze their profiles to find out what they’re doing (and what they’re not), and how you can do it better. You’ll get an idea of what works in your industry, and you can use this information to set better targets of your own. You’ll also be able to spot gaps in their strategies. For example, you might notice that none of your competitors are using Pinterest to market their products. If you find that your target demographic is active on Pinterest, it may be a good idea to plug this gap and provide them with your services. A good way to keep track of your competition is to use a social media tool to monitor them. 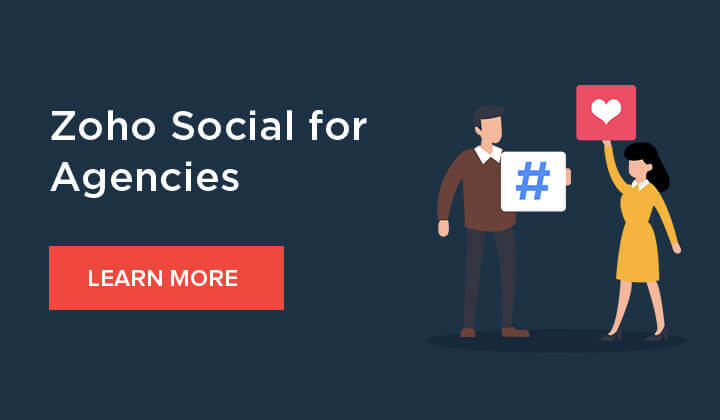 With Zoho Social’s Monitor feature, for example, you’ll be able to track their accounts, the hashtags they use, and whether their campaigns are working or not. You can then use this information to create campaigns of your own. Alright. You’ve identified where you are, you know who your ideal customer is, and you also know what your competition is doing in the same space. Now, it’s time to set your social media goals. After you’ve established your mission statement, it’s time to set some goals. Without these goals, there’s no way to tell whether you’ve succeeded or not. It’s a good idea to make your goals as specific as you can. It also helps to keep them realistic and attainable, so that they’re not lofty dreams that you want to work towards in the distant future, but actionable goals that will give you real results. If you’re able to set goals for each of these metrics, it’ll be much easier for you to analyze whether or not your social media efforts are a success. Want to know a secret? Most brands use these things called social media marketing tools, and that makes their jobs much easier. Okay, maybe that wasn’t much of a secret. But the truth is, investing in an SMM tool can give a real boost to your productivity. Without a tool, it’s difficult to track key metrics and stay on top of your social media presence. We’ve already written a post on how you can choose the best tool for your brand, but to summarize, it’s all about reconciling the features that the tool offers with the goals that you’ve set for yourself. If the features can make it easier for you to achieve your goals, then it’s probably worth investing in. A feature that most tools offer is the ability to schedule your posts in advance. You can use this to plan your content efficiently, while saving time—and you won’t have to always be online to make your posts. A simple Google search will tell you the key differences between the various tools on offer, and you can use that to pick your favorite. However, we recommend you try multiple tools to see which one you’re most comfortable with before committing to a paid plan. If you’ve followed all the steps so far, this one should be a piece of cake. You know who your ideal customers are, you know what they want to see, and you know which networks they’re on. With this information, you should be able to post amazing content that they’ll love. But what exactly is content? There’s tons of content you can create—images, videos, blog posts, podcasts, ebooks, email courses, infographics, interviews—but the best type of content will depend on the network you’re on. It’s also a good idea to keep in mind the goals that you’ve set, and choose content that will align with those goals. Of course, you can choose to post multiple types of content. That’s why it’s important to create a content mix—an approximate percentage of posts you want to make to achieve specific marketing goals. For example, you may decide that you want 60% of your posts to inform, educate, or entertain your audience, 20% curated from other sources, and a further 20% directly promoting your brand. Another good idea would be to create a content calendar. With a content calendar, you’ll be able to plan and organize your content better. You can make sure that your posts are spaced out appropriately, and that you’re following your desired content mix. Some tools come with a built-in calendar that you can use to save time by scheduling content in advance. When you start building your presence on social media by posting regularly, you’ll soon be seeing numbers that tell you how your audience is engaging with your content. Use these numbers to evaluate your strategy, and to identify what’s working and what’s not. Constant measurement will allow you to refine your strategy towards achieving greater success on social media. It’s important to understand that the social media space is extremely dynamic. Things will change in the blink of an eye—new networks may disrupt the status quo, or demographics may undergo a massive shift. It’s also possible that your own company rebrands itself and needs to alter its social media strategy to reflect that. A successful social media strategy is one that’s constantly evolving and open to change. Let the statistics drive you, and keep in mind that you can never really “finish” your social media strategy. It will always be a work in progress—just remember to keep analyzing the results of your efforts, and use them to make necessary changes as and when you need to. So get out there, start creating your strategy, and keep optimizing it as you go. Good luck! Have any questions, or think we missed something? Let us know in the comments below, and we’ll be sure to get in touch with you!